Yamaha FJ1200 Standard Piston Ring Set Includes piston rings for one cylinder; Top, Center & Oil control rings Fours sets required per engine. Yamaha XJ1250/1300 Standard Piston Ring Set Includes piston rings for one cylinder; Top, Center & Oil control rings Fours sets required per engine. 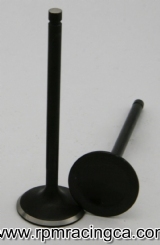 Yamaha Intake Valve; Yamaha FJ1100-1200, XJ1200 and XJR1300. Sold Individually. Yamaha Connecting Rod Bearing; Yamaha FJ1100-1200, XJ1200 and XJR1300 Sold in 1/2 shells. Use dropdown box to select required size/color. A WIX oil filter that will mount directly to the RPM spin-on oil filter conversion adapter.